It's pack filler. The only thing card can do is just makes the priest's resurrection pool worse but there are other cards that are 3/4 that doesn't have a downside. Another tech against Big Priest. 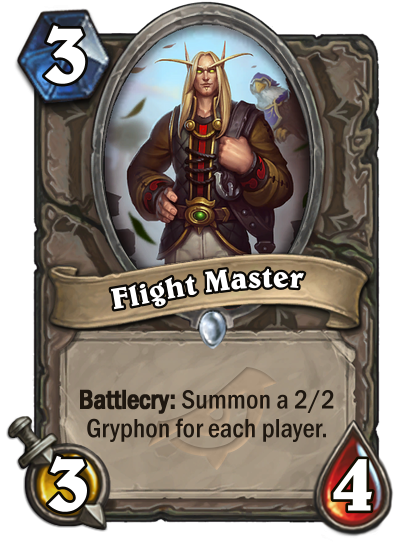 SInce the gryphons are beasts, this is a tech against wild taunt druid as well. Arena card mostly 3/4 is solid I guess win more card, gives you a body to value trade into. Anti big priest tech....overall not good enough i think. lol we went from "res priest is OP!" to "tool to counter res priest, but this isn't good enough"
It's a lot of tempo for turn 3, certainly, but I'd rather save my Backstab to enable combos, not force myself to use it to counteract my own smelly battlecry. And if you're not holding a Backstab, what then? A fairly meh card but there's relatively few of them this set. Wild Odd rogue on turn 3? Big Priest is worth defeating at all cost. Potentially good against Zoo decks and against Resurrect Priest in Wild. not much use outside of that. Am I the only one that thinks this card is a sleeper of the set? On a sad day, this is a slightly worse 3 mana 3/4. In a tempo deck (preferably multiple 2 mana 2/3 run for effect, or 2 mana 2 damage weapon), this is an absolutely insane 2 body 3 mana 5/6.